In recent decades, worldwide contemporary events of expropriations, evictions and dispossessions have come to the forefront of public and academic debates. Similar events to those that occurred in Europe at the dawn of the capitalist mode of production are now being dramatically reproduced in the periphery of the world-system. Africa, for instance, is probably the most significant area of so-called land grabs, considering just one example of dispossession. The Land Matrix (2018) shows that of the 42 million hectares of agricultural land that have potentially been converted from smallholder production to commercial use worldwide, 22 million hectares are African. Departing from Marx’s so-called primitive accumulation, scholars have claimed that such an inaugural process of capital would be an ongoing process. For Saskia Sassen, capitalism has advanced to a new phase of of primitive accumulation that arose as a result of the financialisation of the economy. For others, primitive accumulation never ceased to exist given that it is necessary to late capitalism and, for this reason, must coexist with it (see De Angelis; Hardt and Negri; Harvey). One major problem with these and most other discussions on contemporary dispossessions is relating them to primitive accumulation without paying sufficient attention to whether the former contribute — and, if they do, how — or not to actual capitalist accumulation. For some, the simple occurrence of dispossession seems to be enough to associate it with primitive accumulation or even with capital accumulation. This is the case of the well-known and probably the most influential contemporary approach to primitive accumulation: the concept of ‘accumulation by dispossession’ which David Harvey offers as a terminological alternative given that it would be ‘peculiar to call an ongoing process ‘primitive’ or ‘original’’ (2003:144). For him, ‘accumulation by dispossession’ has ‘become the dominant form of accumulation relative to expanded reproduction’ of capital (Harvey 2003:153). First, it is important to mention the logical impossibility present in this claim, as no value can be distributed without first being produced (Mandel, 1990). The imprecision is also noticeable in the four main elements Harvey draws on to illustrate his concept: privatisation, financialisation, management and manipulation of crises, and state fiscal redistributions. He does not say why one should distinguish the dispossessions brought about by two connected elements as financialisation and manipulation of crises. Furthermore, financialisation can involve state redistributions — e.g., through public debt — and such redistributions can be brought about by privatisation. It is worth highlighting that Harvey himself suggested overlaps like these. To deal with such theoretical deficiencies, one distinction to be made is that accumulation and dispossession are different social processes. Unlike Marx once thought, dispossessions — I understand the term ‘primitive accumulation’ as referring only to the capital’s pre-historical events referred to by Marx — are still developing. They are signs of the times, when neoliberal ideas and their corresponding practices have become hegemonic. Contemporary dispossessions have served to counteract falling rates of profit by pushing down labour costs — Marxian variable capital — in which the social wage is included. As the latter is granted through public policies, one can see why the welfare state has been the main target of neoliberals. Neoliberalism and the dispossessions it promotes have also served to raise profit rates by pushing down the costs of constant capital. Such dispossessions, however, can also simply redistribute economic surpluses that have already been produced. Thus, a second theoretical distinction to be made is between dispossession and exploitation: the latter is the social relation that brings about capital accumulation, while the former is a condition — though not a sufficient one — for the expansion of the scale of accumulation. The distinction between dispossession and exploitation is present in Marx’s study of primitive accumulation given that it ‘takes as its guiding thread precisely the elements which were distinguished by the analysis of the capitalist structure’ (Balibar  2009:313). These elements were those brought about by the ‘separation between the workers and the ownership of the conditions for the realization of their labour’ (Marx 1990 :874). This means that producers cannot work for themselves and therefore must work for others, which in capitalism implies labour exploitation. Primitive accumulation was thus the process through which the capitalist mode of production had its foundational round of both proletarianisation and capitalisation. They respectively turned direct producers into wage-dependent producers and means of production into capital. Looking at the Marxian rate of profit (s÷[c+v]), one can conclude that primitive accumulation created both constant capital (c) and variable capital (v) as such, thus making them available to capitalists for the extraction of surplus-value (s). The distinction between dispossession and exploitation is even more apparent in the Marxian rate of profit. While exploitation impacts the numerator (s), dispossessions can impact the denominator of this rate, namely the costs of either constant capital (c) or variable capital (v). Departing from this and the differentiations mentioned above, I have suggested some theoretical categories of dispossessions in a study that takes into account the different forms in which they relate, contribute, or do not contribute, to the accumulation of capital (Bin 2018). The first concept is redistributive dispossession, which refers to the dispossession that does not create any condition for the expansion of the production of surplus value. It involves nothing but the redistribution of surpluses already produced. In short, I defined it as ‘an appropriation of surpluses that has no impact on capitalization, proletarianization or commodification. Translated into the Marxist formula of profit rate, [redistributive dispossession] increases neither constant capital (c) nor variable capital (v)’ (Bin 2018:82). A clear example of redistributive dispossession is privatisation, once considered by David Harvey as ‘the cutting edge of accumulation by dispossession’ (2003:157). Through privatisations, ‘assets held by the state or in common were released into the market where over-accumulating capital could invest in them, upgrade them, and speculate in them’ (Harvey 2003:158). One of Harvey’s inaccuracies here has to do with treating state-owned assets almost as if they were a commons. There are instead numerous situations when they are deployed in the general process of capital accumulation, to which the state has always been fundamental. More importantly, a simple transfer of ownership by no means leads to the expansion of capital. ‘Accumulation of capital is [the] increase of proletarian labor with its associated constant capital’ (Zarembka 2000:223), none of which are brought about by privatisation. For the process of accumulation to expand, both labour power and means of production must also expand. That is, capital expands through proletarianisation on one hand, and capitalisation or commodification on the other. This leads to two other concepts I have begun to develop in order to deal with contemporary dispossessions and their potential impacts on capital (Bin 2018). One is expanding capitalising dispossession, which, besides proletarianisation — the transformation of direct producers into wage-dependent producers — involves capitalisation, i.e., the transformation of means of subsistence into capital. Examples can be traced from India, with peasants displaced to give room for dam constructions, to Egypt, with fisherfolks displaced by industrial fish farming, to Mozambique, with local communities displaced by mining projects, to Brazil, with urban residents evicted to make room for constructions related to events such as the FIFA World Cup or the Olympic Games. The other concept I have suggested to deal with contemporary dispossessions and their potential impacts on capital accumulation is expanding commodifying dispossession (Bin 2018). As we have seen, expanding capitalising dispossession combines the processes of proletarianisation and capitalisation, which lead to a reduction in the costs of variable capital and of constant capital, respectively. The cost of constant capital can also be driven down by commodification, which means granting means of subsistence with exchange values in addition to the use values they already had. It is true that a commodity is capital; nevertheless, I distinguish commodification from capitalisation in the sense that the latter is the process through which means of subsistence are turned into means of production of commodities. Commodification, more specifically, is the process through which a means of subsistence that was hitherto not a commodity is turned into a commodity. Another distinction between expanding capitalising dispossession and expanding commodifying dispossession is that only the former involves eviction. Nonetheless, both commodifying and capitalising dispossessions involve proletarianisation, which is a condition for capital to expand. In the case of capitalising dispossession, proletarianisation occurs when direct producers are evicted from the place where they produce for themselves. They are then forced to join the labour force, either as employees or as part of the reserve army of labour. In the case of commodifying dispossession, proletarianisation is brought about by denying direct producers access to means of subsistence. One example is the transformation of public into private services, such as healthcare, education or social security. Thus, besides the goal of reducing labour costs — the social wage in these cases — there is a mercantile motivation in these dispossessions. It turns out that the less the state funds healthcare or social security, the greater the potential growth in private health insurance or pension funds. As one can see, the discussion up to this point is fundamentally theoretical. In this sense, the concepts of redistributive dispossession, expanding capitalising dispossession, and expanding commodifying dispossession are ideal types intended to guide empirically oriented studies. The first empirical study I carried out was an analysis of urban interventions in the city of Rio de Janeiro that occurred during the preparations for the 2016 Olympic Games (Bin 2017). In this study, redistributive dispossessions were seen in subsidies and fiscal exemptions granted by both the city and federal governments. The municipal government had committed to granting budget resources to acquire the properties needed to meet the demands of the Games, which included cash settlements for evictions. National government in turn exempted the organisers of the Olympics and their associates from federal taxes on all activities related to the organisation and realisation of the Games. The above dispossessions can be considered redistribution insofar as they do not per se convert means of subsistence into capital nor direct producers into proletarians. Proletarianisation was rather connected to the actual urban interventions. One example was the construction of facilities for the Olympic rowing and canoeing competitions that threatened fisherfolks with displacement from their fishing sites. Others were evicted from sites where they had been running small businesses, or from places near to better public services, to make room for new urban projects. Capitalisation in turn was connected to the conversion of these sites into means of production, such as the land where for-profit mass transportation systems and other urban infrastructure and real estate projects were constructed. In some cases, commodification — which does not involve evictions — stemmed, for instance, from the destruction of environmental reserves to make room for real estate projects or for-profit transportation systems. As I have said, the study of urban interventions that occurred during the preparations for the Rio 2016 Olympics was my first empirical research based on the concepts of dispossession mentioned above. In this study, the theoretical definitions were easier to associate to their historical manifestations in the case of redistributive dispossession. The latter is based on one single social process — redistribution of surpluses — while expanding capitalising and expanding commodifying dispossessions are more complex. Given that each of these involves capitalisation or commodification, respectively, and both involve proletarianisation, their potential empirical synchronicity make the analysis more difficult. This is why the section of my study on the Rio Olympics devoted to expanding dispossession — vis-à-vis redistributive dispossession — was organised under the headings proletarianisation, capitalisation and commodification. These processes provide historical evidence on the more abstract types of dispossession, whose conceptual delimitations nevertheless demand much more historical research. To develop the argument summarised here, I depart from the understanding of most discussions on contemporary dispossessions that relate it to primitive accumulation without sufficient theoretical care when associating it to actual capitalist accumulation. By so doing, such discussions end up moving away from the original conception of Marx, for whom primitive accumulation is ‘a process which operates two transformations, whereby social means of subsistence and production are turned into capital, and the immediate producers are turned into wage-labourers’ (1990 :874). These processes are not always clearly noticeable, or worse, not even present in some contemporary discussions. Thus, my aim has been to bridge contemporary theoretical gaps with some older concepts that are nevertheless useful to better comprehend late capitalism. The objective therefore is no other than to recall that the core of Marxian primitive accumulation stands on the processes of capitalisation and proletarianisation. As such, the latter categories — besides commodification — are central to any analysis intended to relate dispossession to capitalist accumulation. As I have stressed above, the increase of both proletarian labour and its associate constant capital provides the condition for capital to expand. In this sense, the periphery of the world-system is of paramount interest. Rosa Luxemburg ( 2003) once stated that even after the first stages of European capitalism, military power in the central countries was used to appropriate means of production from modern colonies and turn their native populations into proletarians. The periphery remains such a source, and given that capital existence depends upon its expansion, dispossessions in these areas have become even more apparent. At the beginning of this blogpost, I mentioned the significance of similar dispossessing phenomena that took place in Europe at the dawn of the capitalist mode of production as being reproduced in the periphery. Among the regions of the Global South today, it is probably Africa that is the most significant place of so-called land grabs, as well as being a stage for other dispossessions of the means of subsistence, such as fresh water or fishing sites. Perhaps redistributive or expanding — either capitalising or commodifying — dispossessions can be useful categories in order to understand the political economic aspects of such social processes. Daniel Bin is an assistant professor at the University of Brasilia. He is the author of A superestrutura da dívida [The superstructure of debt] (Alameda, São Paulo, 2017). 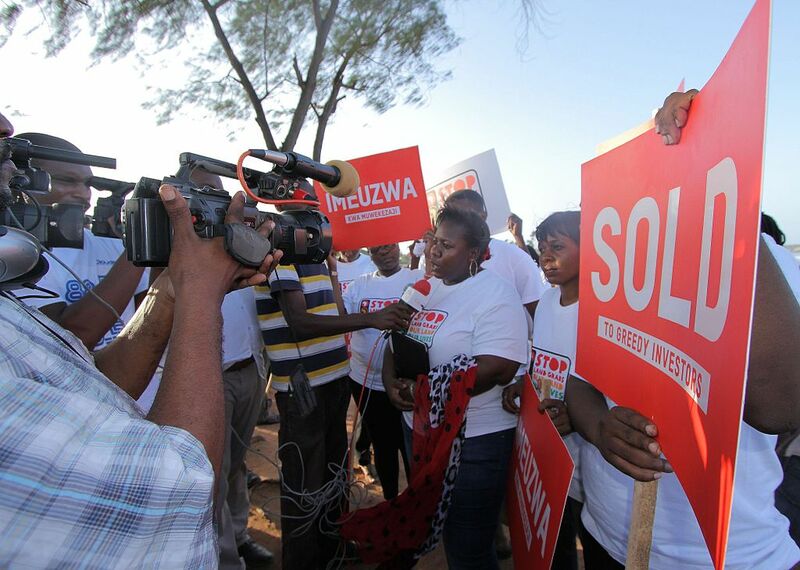 Featured Photo: Tanzanian activists place ‘Sold’ signs along Dar-es-Salaam’s famous Coco Beach as part of Oxfam’s Global Day of Action to stop land grabs in 2013. Balibar, Étienne. 2009. “The basic concepts of historical materialism.” Pp. 223-345 in Reading Capital, edited by Louis Althusser and Étienne Balibar. London: Verso. Bin, Daniel. 2017. “Rio de Janeiro’s Olympic dispossessions.” Journal of Urban Affairs 39(7):924-938. Bin, Daniel. 2018. “So-called accumulation by dispossession.” Critical Sociology 44(1):75-88. Land Matrix. 2018. “Agricultural drivers.” Retrieved 4 March 2018 (http://landmatrix.org/en/get-the-idea/agricultural-drivers/). Luxemburg, Rosa. 2003. The accumulation of capital. London: Routledge & Kegan Paul. Mandel, Ernest. 1990. “Introduction.” Pp. 11-86 in Capital: a critique of political economy (Vol. 1), edited by Karl Marx. London: Penguin. Marx, Karl. 1990 . Capital: a critique of political economy (Vol. 1). London: Penguin. Sassen, Saskia. 2010. “The return of primitive accumulation.” Pp. 51-75 in The global 1989: continuity and change in world politics, edited by George Lawson, Chris Armbruster, and Michael Cox. New York: Cambridge University Press. Sassen, Saskia. 2014. Expulsions: brutality and complexity in the global economy. Cambridge, MA: Belknap. Zarembka, Paul 2000.Value, capitalist dynamics and money. Amsterdam and New York: JAI.